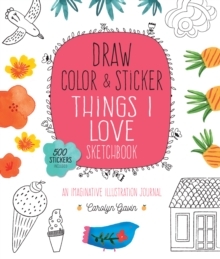 Draw, Color, and Sticker Things I Love is filled with inspiration to get you drawing and stickers and partially illustrated pages help get beginners started. What do you love? Bikes, bouquets, picnics, ice cream? Start sketching your favorite things, then embellish them with color and stickers! Draw, Color, and Sticker Things I Love is a draw and sticker sketchbook that is filled with page after page of beautiful, inspirational designs to help spark creativity, reduce stress, and encourage fun. Not sure what you want to draw? No problem! Stickers and partially illustrated pages provide a rich canvas to help you think about and practice drawing various themes and elements. Each illustrated spread is followed by a more open spread with the same theme and a prompt, ready for you to take the lead and fill in with your own designs and stickers.